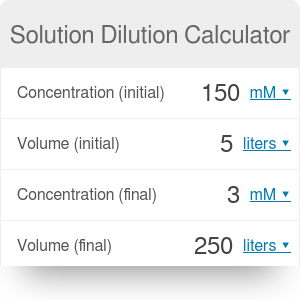 The solution dilution calculator will calculate for you how to dilute a stock solution of known concentration to obtain an arbitrary volume of a diluted solution. Read this article to learn how to use this tool correctly and what units to choose. And if you're interested in chemistry, give our half life calculator a look! The main objective of this this concentration calculator is determining how to dilute a stock solution. Imagine you have a concentrated solution of hydrochloric acid. You can use this calculator to determine how much of it you need if you want to obtain 200 mL of a diluted solution with concentration 20 mM. V₂ is the volume of diluted solution. Note that this equation is not equivalent to the proportion formula. You probably know that the units of volume are either cubed units of length (for example cubic meters, cubic millimeters etc.) or liters. We will just remind you that 1 liter is equal to 1 cubic decimeter. What about the units of concentration, then? You can either use molar or mass concentration. Our solution dilution calculator uses molar concentration, but we will teach you how to recalculate the units of mass concentration, too. Molar concentration c is the amount of substance in moles in a given volume of substance. It is expressed in the unit "molar" (symbol: M), where 1 M = 1 mol/liter. Mass concentration ρ is the amount of substance in grams in a given volume of substance. It is expressed in gram/liter. You can also find it using our molarity calculator. Determine the concentration of the stock solution. Let's say it is equal to 1 mol per liter, or 1 M.
Decide on the final volume of the solution you want to obtain. Let's say you want 0.5 liter of it. Decide on the concentration of the obtained solution. Let's say you want it to be equal to 20 mM. You can also use the solution dilution calculator to obtain any other value. Simply type the remaining three into the corresponding boxes. Solution Dilution Calculator can be embedded on your website to enrich the content you wrote and make it easier for your visitors to understand your message.